Stay tuned for the Spring Capilano Review launch featuring work by Riisa Gundesen at Gallery Gachet in March 2019! Intrusive Thoughts is a solo exhibition featuring self-portraits by Riisa Gundesen. This exhibition explores feminine representation, the abject, and mental health. In the context of Riisa’s work, the abject denies the viewer the anticipated pleasure of looking at the feminine body by showing mental and bodily functions that are often hidden or repressed. 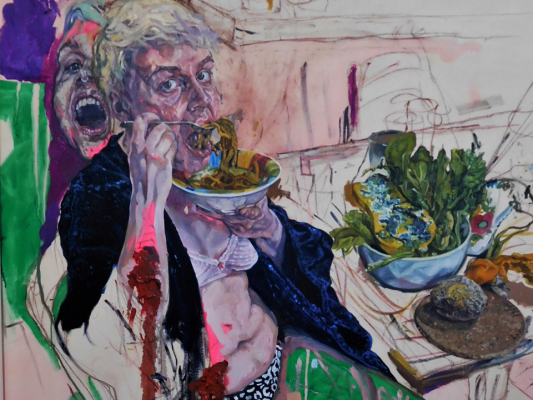 Riisa illustrates compulsive scratching, picking, and over-grooming in her self-portraits through the use of texture, paint, and ambiguous figures. At the same time, she uses rich and energetic paint colours to draw the audience into her paintings and evoke feelings of intrigue, alarm, and empathy. Together, Intrusive Thoughts investigates the possibilities of the abject as a metaphor for lived experience with anxiety, intrusive thoughts, and depression. Riisa Gundesen is a visual artist based in Edmonton. She recieved her BFA from the University of Lethbridge in 2012, and her MFA from the University of Saskatchewan in 2017. In the context of contemporary figurative painting, her work deals with femininity, mental illness, and the abject. Gundesen currently teaches visual art at the University of Alberta and the City of Edmonton.